It’s time for the first Urban Jungle Bloggers Post of 2015! As I’ve mentioned in my past UJB posts I don’t have what you’d call a green thumb. I think I might have even referred to it once as a sooty black toxic thumb. But I’m happy to say that after my new re-found love of having lots of greenery in my home (thanks to Judith and Igor) my thumb is turning an ever so slight shade of the lightest mint green possible. And I hope that with every month that passes the greenness will get brighter and more vivacious. And that I’ll be able to keep more and more plants alive and happy. But really, look how that sweet little succulent above is so healthy and, I like to think, very content looking. At the moment I have a few that are thriving. And a few that are…not. But I’m keeping positive and learning a lot from all of the great links that the UJB team post and share. It’s become such a fantastic and supportive green community of people around the world. This month’s theme is Plants and Coffee (or Tea like I chose). Since my twin daughters are laden down with (way too much) homework we rarely have time to sit down to a nice cup of tea or hot chocolate anymore. So a few Sundays ago I decided to hide their books and persuade them to take a study break with me. That’s right, they’re so studious that I have to HIDE their books for them to agree to take a break. I’m a proud mama. And at times like this a bad influence. 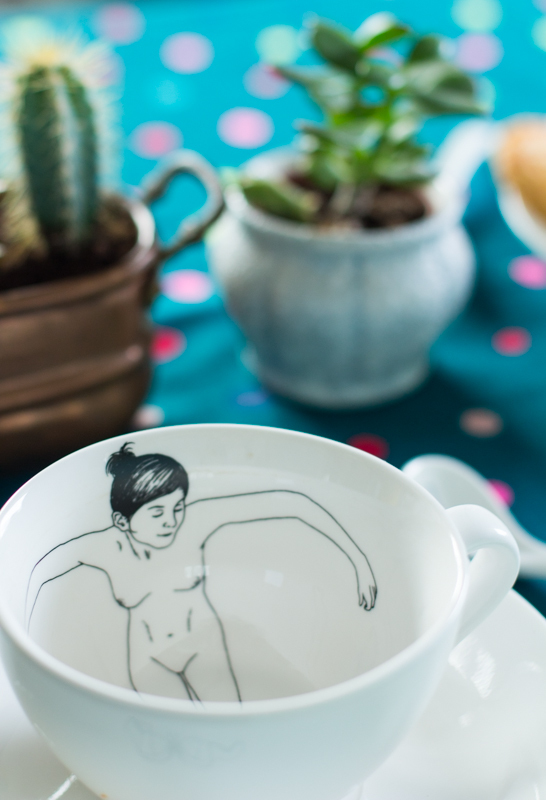 I used my new teacups from Dutch designer Esther Horchner. I love these so much. I had them on my Wishlist board on Pinterest for years so when I saw them in a local shop on sale I knew I had to get them. I just hadn’t expected them to be so shocking for some of my guests (seriously, some of them have to close their eyes when they sip their tea). I decorated the table with some of my favourite miniature succulents and cacti. I found the little copper container at a second hand shop for 2 euro and it’s perfect for these miniature plants I picked up at my local plant shop (I make a concerted effort to buy all my plants locally from small family businesses). And because I’m a fabric and textile lover I decided to use my coveted piece of Japanese double gauze designed by Nani Iro that has been sitting in my fabric cupboard for over a year waiting for the perfect sewing project. Turns out it makes a perfect cloth to adorn an afternoon tea party with the two coolest almost thirteen year olds around. And their equally cool mama (right?). *Urban Jungle Bloggers is a monthly series initiated by 2 bloggers: Igor (Happy Interior Blog) and Judith (JOELIX.com). Every month they share ideas to create an urban jungle through styling ideas, DIYs and green tips & tricks. You can find additional inspiration on their Urban Jungle Bloggers Pinterest board and keep up-to-date on our website and Facebook page. Want to join? Use #urbanjunglebloggers on Twitter and Instagram. Or let them know and they’ll share the badge and upcoming topics with you. Let’s bring some green into our homes and blogs! They have them at Palazzo Reale?! Funny. I think they’re so sweet and innocent. I love those cups and really can’t believe some people will close their eyes. Nani Iro is the best isn’t it? I also have a piece for almost 3 years now, just waiting to be turned into something. Oh…now I’m curious what Nano Iro are you hoarding. oops…I meant “you are” obvs. There’s just something so lovely about them, no? LOVE the tea cups. Who are those guests that close their eyes???? You should be proud of your ‘green fingers’. Those plants look very happy to me. Thanks Tina. I’m just glad you can’t see the plants that are feeling under the weather. Yikes. What a beautiful green tea setting! 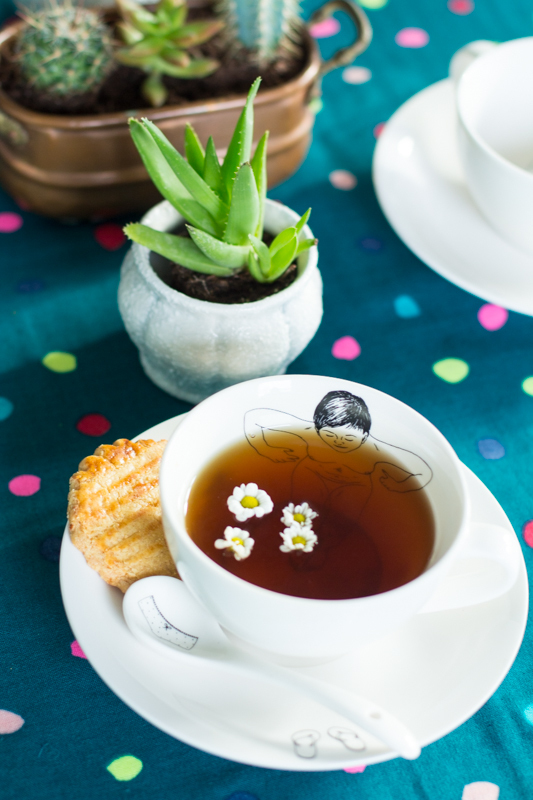 I wouldn’t mind having a cup of tea with you:-) Thank you for joining us! !